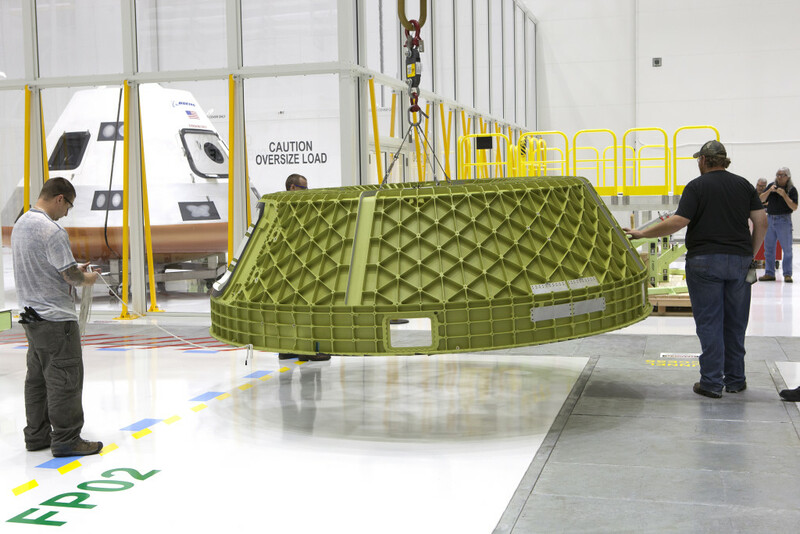 The last major element of a test version of Boeing’s CST-100 Starliner arrived at the company’s spacecraft factory at NASA’s Kennedy Space Center in Florida to begin assembly. The upper dome of the craft the company is calling Spacecraft 1 rolled through the doors of the Commercial Crew and Cargo Processing Facility at Kennedy on May 20 so engineers and technicians could begin outfitting it with systems before joining the upper dome to the docking hatch and lower dome elements that arrived earlier in May. The spacecraft’s arrival points toward a time when the company routinely produces and launches Starliners on operational missions taking astronauts to the International Space Station for NASA’s Commercial Crew Program. Machined into a honeycomb pattern to reduce weight while maintaining strength, the upper and lower domes will form the crew compartment of the Starliner once assembled together. Thermal shielding will encase the domes on the outside and a base heat shield will be connected to the bottom to complete the spacecraft ahead of its pad abort flight test. That flight test will not carry people, but will include an attached service module holding propellant and supply tanks along with four powerful launch abort engines. The test will be an automated demonstration of the launch escape system’s ability of to lift the Starliner out of danger in the unlikely event of an emergency on the launch pad or during the climb into orbit.